Click on the article and podcast titles below for viewing and listening. June 3, 2018 - ATRE 9-Year Anniversary Referenced In "Home Magazine"
February 16, 2018 - Rey Post Offers Observations On "Leadership"
June 6, 2016 - Rey Post Talks Campaigns & "All Things Real Estate"
June 5, 2015 - Rey Post Talks 6-Year Anniversary of "All Things Real Estate"
June 5, 2014 - Rey Post Hosts "Green Building & Sustainable Development"
June 5, 2014 - Rey Post Hosts "KVSF Morning Show"
June 4, 2014 - Rey Post Hosts "KVSF Morning Show"
June 3, 2014 - Rey Post Hosts "KVSF Morning Show"
April 6, 2014 - ATRE Remote Broadcast From "Home Show"
August 15, 2013 - Rey Post Guest On "Green Building & Sustainable Development"
June 6, 2013 - Rey Post Hosts "Green Building & Sustainable Development"
Sotheby's International Realty will host a special radio program to air from the Santa Fe Concorso Rare Car Event on Sunday Sept. 30 from noon to 2 p.m. (MST). The All Things Real Estate radio show will be staged from The Club at Las Campanas as part of the annual Santa Fe Concorso, a gathering of rare and exotic cars and motorcycles. The program, hosted by Rey Post, associate broker with the Santa Fe office of Sotheby's International Realty, will air on 1260 KTRC-AM and also stream audio and video of this event to a national audience on SantaFe.com. Additional information about the weekly radio show show can be obtained via www.ATREradio.com. The Santa Fe Concorso, now in its third year, will feature three days (Sept. 28-30) of a spectacular assemblage of "rolling works of art," including more than 100 classic cars, legendary motorcycles and vintage aircraft. Legends of the racing world, Sir Stirling Moss, Santa Fe's own Denise McCluggage and four-time Indianapolis 500 winner Al Unser Sr. will be among the featured guests. For Santa Fe Concorso schedule and ticket information, go to www.santafeconcorso.com. SANTA FE, NM, May 24- Sotheby's International Realty (“SFRP”) and Hutton Broadcasting today announce the one year anniversary of the first broadcast of the highly successful, 1260 KTRC-AM weekly radio program, “All Things Real Estate.” On Sunday, June 6th beginning at 12pm, the program will commemorate this milestone with a “live” remote broadcast from the Santa Fe office of Fidelity National Title Insurance Company located at 515 Don Gaspar Avenue. The well-known title insurance company is one of the original corporate “Partners” of the radio program and is staging a celebratory party for the public following the airing of the real estate radio show. Radio program host, Rey Post, will be joined in the broadcast booth by special guest commentator Steve Riemann, Santa Fe Area Manager of Fidelity National Title Insurance Company. Riemann was Post’s in-studio guest when the show first aired to KTRC listeners on Sunday, June 7, 2009. The June 6th program is one in a series of remote broadcasts that takes the weekly program to a variety of northern New Mexico locations through the end of 2010. “We are very appreciative of the public’s positive response since we launched the “All Things Real Estate” brand less than a year ago,” said Rey Post. “Besides the popular radio show, our information-packed monthly newsletter and video taped interviews of real estate related issues seem to be real hits with New Mexicans,” continued Post. “All Things Real Estate,” which addresses every aspect of the real estate experience important to buyers and sellers of residential and commercial property, airs each Sunday (12-1pm) on Santa Fe’s #1 newstalk station, KTRC-AM. Show host Rey Post, is an Associate Broker at SFRP, and also serves as a Licensed Realtor in Washington, DC. “We salute Rey for bringing content-rich real estate commentary each week over this past year to a large number of loyal KTRC-AM listeners, said Scott Hutton, owner of Hutton Broadcasting, Inc. “We value the contribution “All Things Real Estate” makes to our line-up of local programming and rate the creative format of the show and the professional delivery Rey brings to the program as among our very best,” continued Hutton. “We are proud of what Rey and the real estate radio show, newsletter and video taped interviews have accomplished this past year in presenting compelling and useful information to New Mexicans,” added SFRP’s co-owner and Qualifying Broker Tommy Gardner. SFRP is one of Santa Fe’s leading real estate companies, with more than 85 of the region’s most highly regarded broker professionals with decades of combined experience assisting local and national clients. 1260 KTRC-AM "ALL THINGS REAL ESTATE" Radio Show Airs On Sunday, May 9th From Santa Fe Community Convention Center. Sotheby's International Realty ("SFRP") and 1260 KTRC-AM today announce the 2nd in a series of live remote broadcasts of the highly successful, weekly radio program, "ALL THINGS REAL ESTATE." On Sunday, May 9th beginning at 12pm, the program will air from the Santa Fe Community Convention Center as part of the Santa Fe Area Home Builders Association Home Design & Remodeling Show. Radio program host, Rey Post, will interview officials of the Association, as well as experts about home staging, tax incentives and rebates for remodeling and the use of energy efficient appliances and materials. Joining Post in the broadcast booth will be special guest commentator Steve Riemann, Santa Fe Area Manager of Fidelity National Title Insurance Company. The Home Design & Remodeling Show is being staged at the downtown Convention Center on Saturday May 8th and Sunday, May 9th and is free and open to the public. The May 9th remote broadcast of "ALL THINGS REAL ESTATE," comes on the heels of a highly successful remote broadcast staged on April 4th from the Bavarian Chalets in the Taos Ski Valley. Remote broadcasts of the weekly radio show will air on select Sundays through the fall from business locations around Santa Fe, as well from public open houses staged by SFRP brokers. The show will also air from the grand prize winning Santa Fe property at the Home Builders' "Parade of Homes" event on August 22nd. A full schedule of remote broadcast events can be found here. "We are delighted to be able to bring "ALL THINGS REAL ESTATE" via remote broadcasts to thousands of loyal Sunday listeners, as well as directly to people who will be attending theses events," said Rey Post. "The Home Builders' Design & Remodeling Show this Sunday will be attended by scores of people who are seeking expert advice on how to enhance and improve their own homes," continued Post. 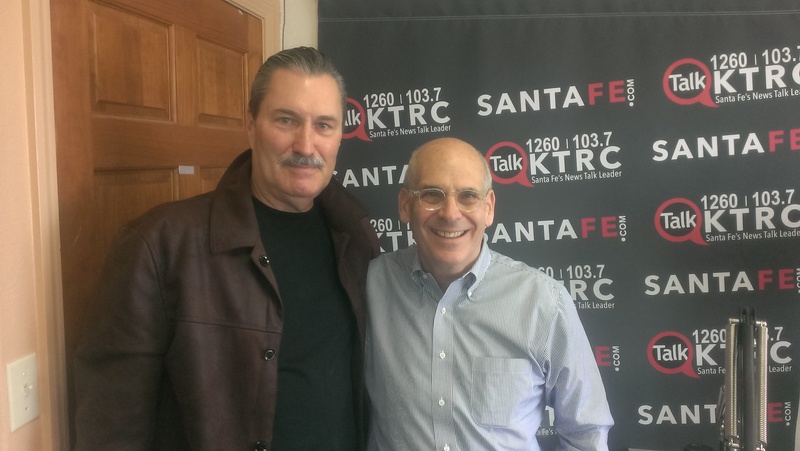 "ALL THINGS REAL ESTATE," which addresses every aspect of the real estate experience important to buyers and sellers of residential and commercial property, airs each Sunday (12-1pm) on Santa Fe’s #1 newstalk station, KTRC-AM. Show host Rey Post, is an Associate Broker at SFRP, and also serves as a Licensed Realtor in Washington, DC. "We are delighted that Rey is bringing his professional and well-informed style and content-rich real estate commentary to all of the remote broadcasts of "ALL THINGS REAL ESTATE’" said Scott Hutton, owner of Hutton Broadcasting, Inc.
"We know that real estate is a topic that is on the minds of most people, and by airing the show from interesting venues, we plan on bringing our good advice and useful information right to the doorsteps of consumers," added SFRP's co-owner and Qualifying Broker Tommy Gardner. SFRP is one of Santa Fe's leading real estate companies, with more than 85 of the region's most highly regarded broker professionals with decades of combined experience assisting local and national clients. 1260 KTRC-AM "ALL THINGS REAL ESTATE" Radio Show Going “On The Road” With Launch of Remote Broadcasts on Sunday, April 4th in Taos. Sotheby's International Realty ("SFRP") and 1260 KTRC-AM today announce a series of live remote broadcasts of the highly successful, weekly radio program, "ALL THINGS REAL ESTATE." On Sunday, April 4th beginning at 12pm, the program will air from the deck of the Bavarian Restaurant, off of Route 150 in the Taos Ski Valley. The show will offer interviews with local Taos "celebrities" as well as public tours of SFRP’s award-winning Bavarian Chalet properties. Those who tour the chalets will be entered into raffles for major prizes including Taos lodging, restaurant gift certificates, lift tickets, rafting trips and many more free gifts. KTAOS 101.9 FM will also be staging a music simulcast from the deck of the Bavarian for local listeners, as well as interviews with "ALL THINGS REAL ESTATE" guests and the show’s host, Rey Post. The Taos remote broadcast of "ALL THINGS REAL ESTATE," signals the beginning of a series of similar events that will be staged through the end of 2010 from interesting properties and businesses in northern New Mexico Besides the Bavarian Chalets event in Taos, the weekly program will also air on select Sundays from events at the Santa Fe Community Convention Center, from various public open houses staged by SFRP brokers, from the Santa Fe Area Homebuilde’s "Parade of Homes" in August and from business locations in Santa Fe. A full schedule of events is under development and will be available by mid-April on the radio show webpage of the SFRP website (www.sfrp.com). "We are delighted to be able to bring "ALL THINGS REAL ESTATE" via remote broadcasts to not only our thousands of loyal Sunday listeners, but also directly to people who will be attending the events that are hosting our broadcasts,” said Rey Post. "The Bavarian Chalets remote this Sunday is bound to be a lot of fun for scores of people who are closing out the ski season in Taos," continued Post. "ALL THINGS REAL ESTATE," which addresses every aspect of the real estate experience important to buyers and sellers of residential and commercial property, airs each Sunday (12-1pm) on the Santa Fe radio station. Show host Rey Post, is an Associate Broker at SFRP, and also serves as a Licensed Realtor in Washington, DC. "We are delighted that Rey is bringing his professional and well-informed style and content-rich real estate show to this series of remote broadcasts beginning with the Bavarian Chalets event in Taos," said Scott Hutton, owner of Hutton Broadcasting, Inc. "The universal interest among our listeners in all matters of real estate makes the show a natural for remote broadcasts from unique events and locations throughout northern New Mexico," continued station owner Hutton. "We know that real estate is a topic that is on the minds of most people, and by airing the show from interesting venues, we plan on bringing our good advice and useful information right to the doorsteps of consumers," added SFRP’s co-owner and Qualifying Broker Tommy Gardner. SFRP is one of Santa Fe's leading real estate companies, with more than 85 of the region's most highly regarded broker professionals with decades of combined experience assisting local and national clients. Sotheby's International Realty (“SFRP”) and 1260 KTRC-AM today announce the 2nd live ‘remote’ broadcast of the highly successful, weekly radio program, “ALL THINGS REAL ESTATE.” On Sunday, October 25th beginning at 12pm, the program will air from the Santa Fe Area Homebuilders Association Green Building Summit & EXPO, which will be staged at the Santa Fe Community Convention Center. The show will air from an area at the entrance to the floor of the Convention Center, which features more than 60 “green” exhibitor booths that comprise the EXPO component of the four-day event. The EXPO is free and open to the public. The radio show aired its inaugural remote broadcast in August from the “Emerald Home” during the annual ‘Parade of Homes’ tour sponsored by the Homebuilders Association. “We are delighted to stage the 2nd remote broadcast of “ALL THINGS REAL ESTATE” from this very special event,” said Rey Post, host of the weekly real estate radio show. “I will be interviewing members of the Santa Fe homebuilders community and other EXPO participants regarding the important role that going “green” plays in the future of residential construction in our city and state,” continued Post. “ALL THINGS REAL ESTATE,” which addresses every aspect of the real estate experience important to buyers and sellers of residential and commercial property, airs each Sunday (12-1pm) on the Santa Fe radio station. Show host Rey Post, is an Associate Broker at SFRP, and also serves as a Licensed Realtor in Washington, DC. “We are delighted that Rey is bringing his professional and well-informed style and content-rich real estate show to this major Santa Fe event,” said Scott Hutton, owner of Hutton Broadcasting, Inc. Though normally broadcast weekly from the 1260 KTRC-AM studio, Post and the radio station staff are planning a series of remote broadcasts of “ALL THINGS REAL ESTATE” from unique locations in greater Santa Fe. “The universal interest among our listeners in all matters of real estate makes the show a natural for occasional remote broadcasts from unique events and locations like the Convention Center hosted Green Building Summit & EXPO,” said station owner Hutton. “We know that real estate is a topic that is on the minds of most people, and by airing the show from interesting venues, we plan on bringing our good advice and useful information right to the doorsteps of consumers,” added SFRP’s co-owner and Qualifying Broker Tommy Gardner. SFRP is one of Santa Fe’s leading real estate companies, with more than 75 of the region’s most highly regarded broker professionals with decades of combined experience assisting local and national clients. The weekly radio show is supported by a variety of Santa Fe area and national corporate sponsors who contribute their expertise and services to the New Mexico real estate process. Among the show’s major sponsors are Los Alamos National Bank, Fidelity National Title, The Rubin Katz Law Firm, HUB International, Major Development, Inc., Linson’s, Inc., Andrew Hoffman and Stephen’s, A Consignment Gallery. Santa Fe Realty Partners ("SFRP") and 1260 KTRC-AM today announce the first live 'remote' broadcast of the highly successful, weekly radio program, "ALL THINGS REAL ESTATE." On Sunday, August 23rd beginning at 12pm, the program will air from the "Emerald Home" which is located in the Monte Sereno subdivision of Santa Fe, and is the pilot project for the new Santa Fe Green Building Codes. This new home is expected to achieve New Mexico’s highest green building certification, as well as the Platinum certification in the U.S. Green Building Council’s LEED (Leadership in Energy & Environmental Design) system. The new construction home, located at 2962 Broken Sherd Trail, is one of 28 properties featured in the annual "Haciendas- A Parade of Homes" event sponsored by the Santa Fe Area Homebuilders Association. "We are delighted to stage our inaugural remote broadcast of "ALL THINGS REAL ESTATE" from this very special home," said Rey Post, host of the weekly real estate radio show. "I look forward to sharing with the show's listeners how the innovative design and use of unique building systems, materials and renewable energy in the construction of this home will set a standard for future home building," continued Post. "ALL THINGS REAL ESTATE," which addresses every aspect of the real estate experience important to buyers and sellers of residential and commercial property, airs each Sunday (12-1pm) on the Santa Fe radio station. Show host Rey Post, is an Associate Broker at SFRP, and also serves as a Licensed Realtor in Washington, DC. "Rey and his real estate radio show are an important part of our weekly line-up of local shows that provide our loyal 1260 KTRC-AM listeners with content rich programming," said Scott Hutton, owner of Hutton Broadcasting, Inc. "Though the show has aired for only 2 1/2 months, "ALL THINGS REAL ESTATE" has already generated considerable listener attention based upon the public feedback we receive on a weekly basis," continued Hutton. Though normally broadcast weekly from the 1260 KTRC-AM studio, Post and the radio station staff are planning a series of remote broadcasts of "ALL THINGS REAL ESTATE" from unique locations in greater Santa Fe. "Rey's professional and well-informed style, combined with the universal interest among our listeners in all matters of real estate, makes the show a natural for occasional remote broadcasts from out of the ordinary sites around the city," said station owner Hutton. "We know that real estate is a topic that is on the minds of most people, and by airing the show from interesting venues, we plan on bringing our good advice and useful information right to the doorsteps of consumers," added SFRP's co-owner and Qualifying Broker Tommy Gardner. SFRP is one of Santa Fe’s leading real estate companies, with more than 75 of the region’s most highly regarded broker professionals with decades of combined experience assisting local and national clients. The weekly radio show is supported by a variety of Santa Fe area and national corporate sponsors who contribute their expertise and services to the New Mexico real estate process. Among the show’s major sponsors are Los Alamos National Bank, Fidelity National Title, The Rubin Katz Law Firm, HUB International, Major Development, Inc., Andrew Hoffman and Stephen's, A Consignment Gallery. Santa Fe Realty Partners Launches "ALL THINGS REAL ESTATE"
Sotheby's International Realty ("SFRP") today announces the successful launch of the weekly, live, listener-interactive radio program, "ALL THINGS REAL ESTATE," heard every Sunday from 12-1pm on Talk 1260 KTRC-AM. The program, which addresses every aspect of the real estate experience important to buyers and sellers of residential and commercial property, aired its inaugural broadcast on the Santa Fe radio station on June 7th. The show is hosted by Rey Post, an Associate Broker at SFRP, who also serves as a Licensed Realtor in Washington, DC. "We were overwhelmed by the positive response we heard from listeners following the broadcast of the first program," said SFRP's co-owner and Qualifying Broker Tommy Gardner. "We know that real estate is a topic that is on the minds of most people, and our goal is to offer good advice and useful information to buyers and sellers of property and land in Northern New Mexico," continued Gardner. SFRP is one of Santa Fe's leading real estate companies, with more than 75 of the region’s most highly regarded broker professionals with decades of combined experience assisting local and national clients. The weekly radio show is supported by a variety of Santa Fe area and national corporate sponsors who contribute their expertise and services to the New Mexico real estate process. Among the show's major sponsors are Los Alamos National Bank, Fidelity National Title, The Rubin Katz Law Firm, HUB International and Stephens Consignment Gallery. "Each week I am joined by a special in-studio guest in a fast-paced show format that also includes "live" interview and pre-taped information segments, listener questions and a call-in interview with a fellow broker hosting a Sunday 'open house' at a Santa Fe property," said show host Rey Post. "The show is intended to not only provide our listeners with valuable real estate counsel, but to also offer them with a sense of hope as the national and local economy is starting its recovery. US News and World Report (usnews.com) just reported that research indicates Santa Fe will be among the top 10 housing markets in the U.S. over the next decade. We believe that the launch of " ALL THINGS REAL ESTATE" couldn't come at a better time to help buyers and sellers take advantage of this positive economic news," continued Post. "We are very pleased to have "ALL THINGS REAL ESTATE" as part of our weekly line-up of content rich programs on Talk 1260 KTRC-AM," said Scott Hutton, owner of Hutton Broadcasting, Inc. Feedback from KTRC listeners after the first airing last Sunday of the live show, indicates that Rey Post's easy going, professional and well-informed style of delivering useful real estate information will guarantee a loyal listening audience for all future broadcasts. We are optimistic the show will be a big hit in the community," continued Hutton.